This content requires the base game in order to play. 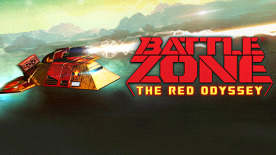 New campaigns, new maps, cloaked vehicles, devastating ambushes and dangerous portals: Get ready for The Red Odyssey, the explosive DLC expansion for the-critically acclaimed Battlezone 98 Redux! Almost 20 years on, and available for the first time ever outside of North America, The Red Odyssey has returned! Jump back into your cockpit and lead two new factions; the NDSF Black Dogs or the Chinese Red Army, in a deadly campaign to control a powerful Cthonian portal technology. Which side will prevail? • Just like Battlezone 98 Redux, The Red Odyssey expansion also features completely remastered visuals, remodelled vehicles, enhanced lighting, detailed terrains ... and much more!"